Today is the feast of St. Catherine di' Ricci, one of the wonderful saints of our Order and it is a fitting day to introduce you to a new member of our community! Sr. Mary Catherine comes to us from the Monastery of Our Lady of Grace, North Guilford, CT, our first foundation that we made in 1947. They in turn founded Corpus Christi Monastery in Karen, Nairobi and our African sisters refer to our monastery as "Grandma's House"! Because Sister shares the same name with our Sr. Mary Catharine she has chosen to be known as Sr. Mary John while she is with us for the next three years. We are grateful to God and to our North Guilford Sisters for Sister's presence among us and we look forward to being the recipients of her many gifts and talents, especially the organ! For now, she is taking time to acclimate herself to where everything is in the monastery and when to be where! Although the essentials of our life are the same in each monastery there are many little local customs and ways of doing things that can leave a new-comer bewildered for the first few days! 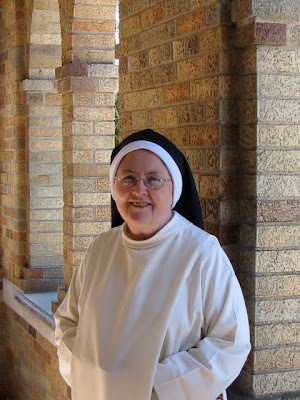 Please pray for Sr. Mary John and join us in welcoming her to our monastic family!